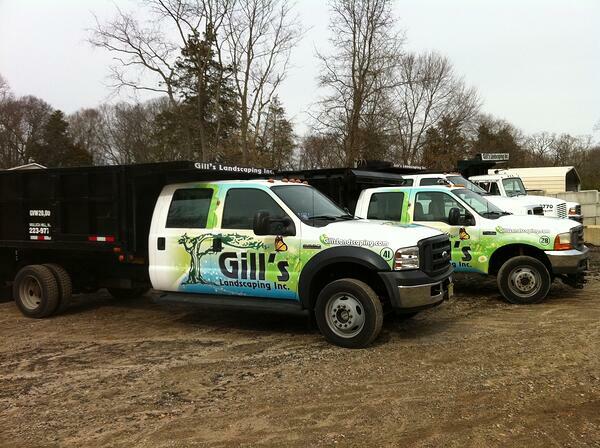 We've been growing alongside Gill's Landscaping through the years, helping them brand their trucks, equipment, and trailers. So when they called us up and said they wanted to get a new tow-behind trailer wrapped, we were more than ready to help them out! 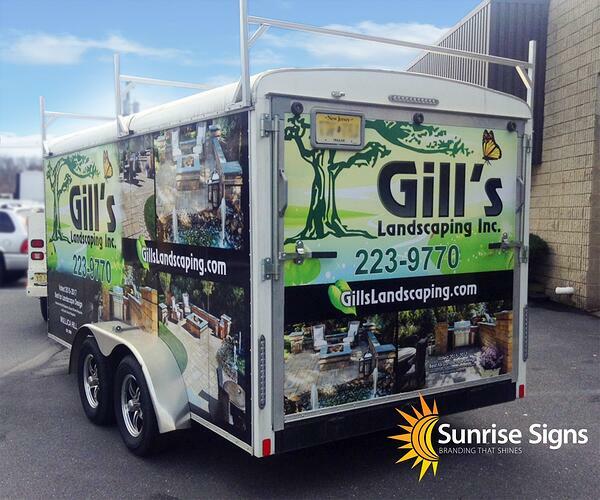 Gill's Landscaping purchased a new trailer to help haul their equipment and supplies to job sites. 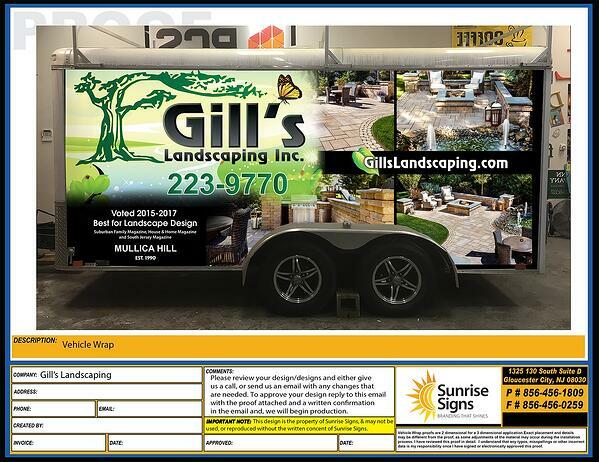 Knowing this was a great branding opportunity, Gill's was ready to get rolling on the wrap project as soon as possible! Using photos and measurements of their trailer, we drafted a unique design that fits with the theme and colors of the vehicles we previously wrapped for them. 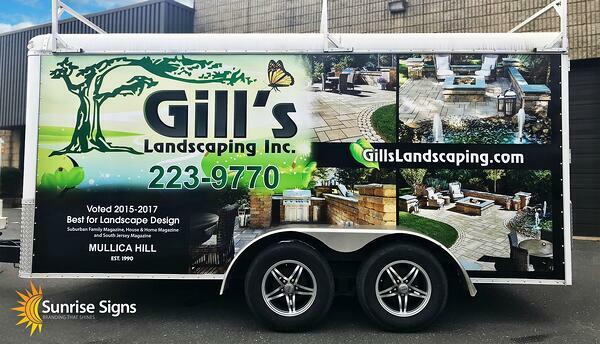 Gill's Landscaping takes great pride in their projects and wanted to feature some of that work in the trailer design - and we were more than happy to accommodate. They had a photographer take several professional photos of their projects, which we then incorporated into a collage that ran along the sides and rear of the trailer. Despite being a pretty straight-forward installation, our vehicle wrap installers made sure to fit everything perfectly, and cut around the side door and rear hinges to install a beautiful looking yet functional wrap. We covered and rolled down over the rivets on the trailer to help ensure a long lasting and durable wrap. 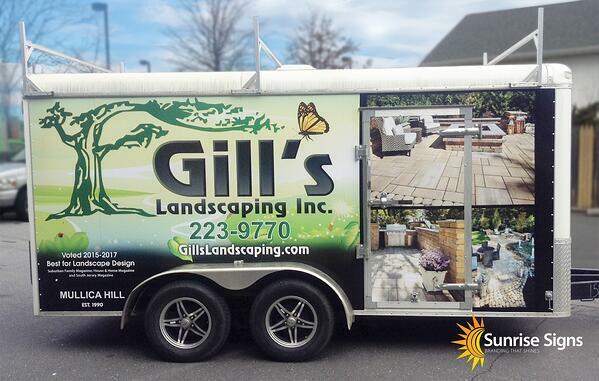 As you can see, Gill's Landscaping has sharp new trailer that compliments their already existing fleet branding. 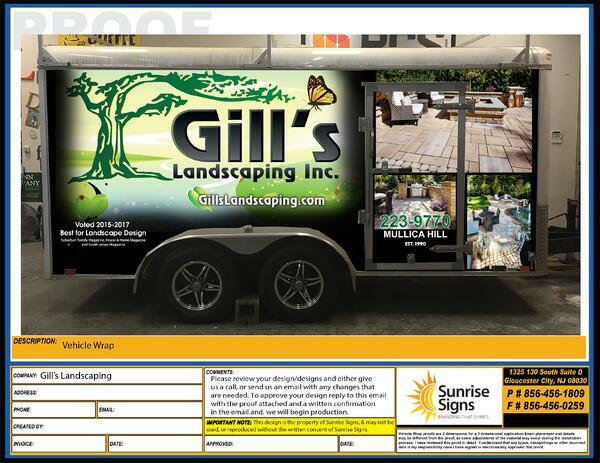 With this new addition, Gills is helping increase the amount of impressions the make while on the road and making great, professional impressions when they arrive at a customer's house to work. Have an equipment trailer that you'd like to help your marketing? Are you constantly driving around and visiting customer's homes? Then vehicle wraps are the answer to create effective branding and help promote your business. Give us a call today and see what we can do!